My Little Pony Arena » Forums » Pony Talk » Pony Corral » Pony Innards! 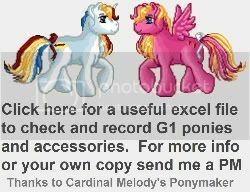 Forums » Pony Talk » Pony Corral » Pony Innards! Posted: 0 Post subject: Pony Innards! It's gross, but I need to know about the insides of the ponies. Basically those with a mechanism inside! Do you have pictures you can show me? How do you remove the mechanism should you need to? ..or get the head off in the first place! I know the Happy Tails have metal parts inside, since I just have opened up a Tabby.. and well.. she's rusting. How do I get the stuff out? And how to I be-head a B'n'G? Posted: 0 Post subject: Re: Pony Innards! Oh, it would be sooo great if they would not rust, since I had to dunk and submerge 2 of my B'n'Gs in Oxy overnight recently, because they had a REAL moldy smell. Should they rust I'd even be ok with glueing the head back on, having a long tail all the time and no working mechanism I guess..
LOL, well that is a tread title you don't see everyday! It looks rather awful and un-removable to me, and it also has metal parts. Lina: Oh no.. I submerged to twisty tails in bleach overnight because they were as moldy as they could get. No rust yet however.. at least on the OUTSIDE. Maybe I have to take a hammer to destroy the mechanism inside? BlackCurtains: That's great info! Thanks! Esp. on the B'n'Gs! Does this mean you can't just glue BnG's heads back on?